With the never-ending queues at KOI and Gong Cha bubble tea, my guess is that the bubble tea craze in Singapore will be here to stay for a little longer. Just that day, I was asking on twitter which is the first KOI outlet in Singapore, but no one was sure about the answer. Most people replied that Chinatown is the first KOI branch and apparently they have been there for a couple of years. It’s funny how most people only come to know about it in the past two years. 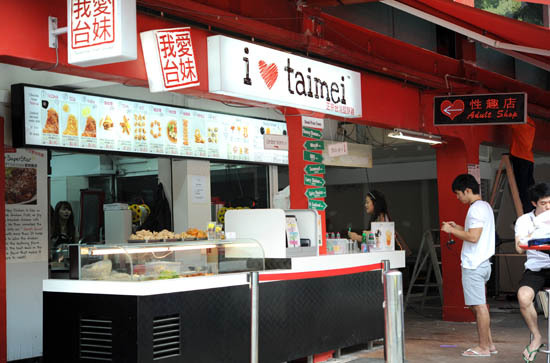 The same goes for I love Taimei, a small Taiwanese cafe located at 52 Queen Street at Bugis Village that sells Taiwanese street food in Singapore. Even though I always pass by the area, I didn’t notice the place until recently. I heard that they are opened for a year (or maybe slightly longer), and they are getting popular with the crowd at Bugis Village. A regular bubble tea is $2, while most of the Taiwanese street food like the fried chicken, burger, mee sua are around $3-4. A set meal consisting of a main, side and drink will cost around $6-7. Interestingly, I love Taimei is just around the corner from KOI at Iluma. I am no expert when it comes to bubble tea, but I had I love Taimei’s bubble tea on a few occasions, and I definitely don’t think that it will lose out to KOI. As much as I enjoyed the KOI bubble tea, I still have no idea why people will queue up half an hour just for a cup of bubble tea. On the first occasion, I had the BBQ Crispy Chicken ($3.90). It was crispy and drizzled with the spicy-sweet BBQ sauce. Obviously, this isn’t going to be as fantastic as the Ji Pa (deep-fried chicken) that you had in Taiwan. The grass will always be greener on the other side, and Taiwanese street food will definitely taste better when you have them at the Taiwanese night markets. Wake up people, we are in Singapore (not Taiwan), and we just have to make do with what we have. The portion of the chicken was considerably small for four dollars, but when craving call, you know there’s nothing you can do. I also had the cheese fries ($2), which was pretty decent. Coated with a layer of cheesy texture, it’s the ideal snack to munch the afternoon away. It was raining heavily during my second trip there, and the Oyster Mee Sua ($3) was the perfect companion in the sleepy weather. If I’m not mistaken, there’s a strong hint of vinegar within the sticky and soupy mee sua, which had bits and pieces of tiny little oysters. It was very comforting to stand by the road side, and scoop the mee sua from a bowl. Suddenly, I felt that I was in Taiwan again. 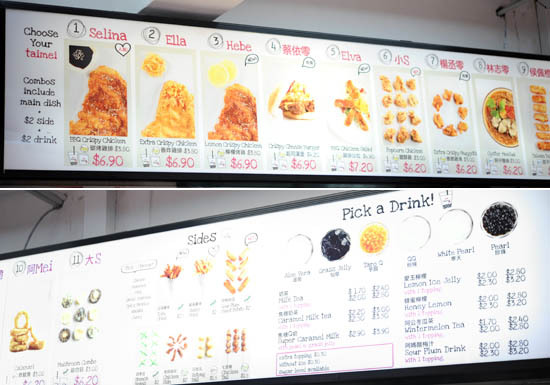 Other than the Oasis and Gold Leaf Taiwanese porridge restaurants, Peng Lai Ge at Joo Chiat, Shin Yeh Taiwanese restaurant at Liang Court and the newly opened Ximending at Vivo city, there aren’t that many options for Taiwanese food in Singapore. 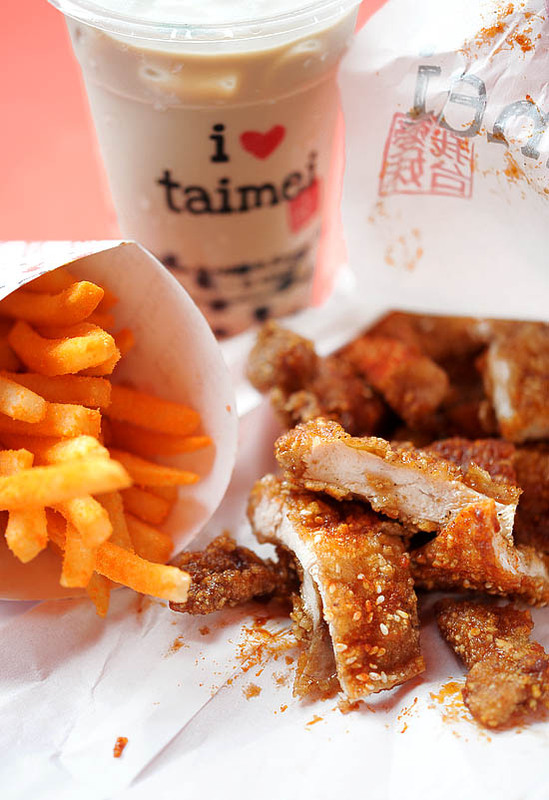 Since I chanced upon I Love Taimei, I’m always tempted to order a snack whenever I am in the Bugis area. Forget about everything that I just told you. Forget that you read this post on I love Taimei. I do not want to see any of you queuing up in front of me the next time I am there! I love I love taimei! The tofu fries with seaweed seasoning is superlicious! And I think their bubble tea is really more worth it than Koi’s. Their caramel milk tea with taro Q is the best! Try the chicken skin! Super sinful, unhealthy and fattening but totally awesome!! reminds me of the famous rap song which has the same title! who doesnt like fried food, this looks awesome! LFB: HAVE FUN IN TAIPEI! Jor: oh yes my friend was raving about their tofu fries too. it’s really so good? It’s crazy seeing the Q outside Koi when I was back earlier this year. Having stayed in Taipei for the past 14 years, I think I’ve had my fair share of bubble tea. I still remember the first bubble tea I had, it was in Ximending. My friend got me “por bah nai cha” it has SUPER huge pearls in it. I almost gagged!! first koi outlet is in toa payoh. had it since it open in 2007. they used to have small pearls or jumbo pearls to choose from but sadly they made it standard size since they had gotten popular. hmm i didnt have to wait that long for bubble tea at i love taimei as compared to koi, but i waited a whole hour for my chicken! they don’t seem very well prepared for business, and the slow service was quite disappointing… the cheese and seaweed flavours were unavailable during my visit as well… but do try the tofu fries, they are pretty interesting! Definitely gonna try this soon! Yup agreed! First outlet for koi is at toa payoh. Then marine parade, chinatown, amk hub, illuma and now clementi. Miss the days when there was no craze over KOI so I get to have it without queuing. Pigiangel: I WANNA GO TAIWAN NOW!!! didnt i love taimei move to bugis junction? pls update thx. I would say the quality of the tea is similar to KOI and the bubble are pretty good too. I do agreed KOI have the best bubble tea in singapore but Eskimo is not far behind either in terms of quality. I tried the bubble milk tea from I love taimei! It was really good! Thanks for blogging about it. I went to try it after I read your blog post. Oh my! Im going to try this tomorrow with my friend! I just touched down from TAipei today and I’m suffering from Taiwan-Withdrawal Syndrome!! anyone know any cure for that?? YES. I so miss those days in Toa Payoh when no one buys KOI — no q — no waiting time! And i dnoe why suddenly theres a hype abt KOI. YES 2007~~ those days <3 <3. and omg so gonna try caramel milk tea w taro q from i <3 taimei. Can't wait!